A number of roadmaps and initiatives were proposed over the last few days as a way out of the current crisis in Egypt, several of which came following massive opposition protests on Sunday and an ultimatum by the military that sparked celebration among anti-Morsi protestors and anger among the president's supporters. All opposition roadmaps propose early presidential elections and temporary state management through the head of Egypt's High Constitutional Court and a technocrat cabinet, with none of these leaders to run for the presidency. The call for 30 June rallies started with the Tamarod ('Rebel') campaign, which since May has been collecting signatures from Egyptians nationwide requesting that Morsi step down. The campaign claims to have collected over 22 million signatures, as per the campaign's latest update on 29 June, which significantly outnumbers the 13 million voters who cast ballots for Morsi in presidential elections one year ago. 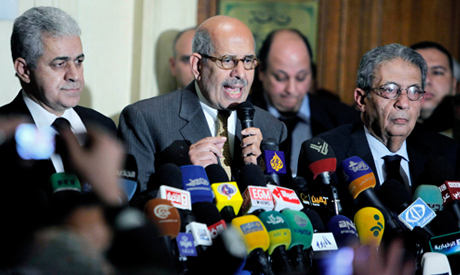 The call for the formation of the '30 June Front,' included, together with the Rebel campaign, most of the organised non-Islamist political forces who oppose the Muslim Brotherhood. It includes activists and the National Salvation Front (NSF) opposition umbrella group. The main opposition coalition, formed in November 2012 to oppose the constitutional declaration made by President Morsi ahead of the completion of the constitution, announced its endorsement of Rebel's roadmap and joined the 30 June Front. The Strong Egypt Party, formed by ex-Muslim Brotherhood presidential candidate Abdel-Moneim Abul-Fotouh, on the eve of 30 June called for a number of measures to get out of the crisis, announcing that it would join the protests to complete the revolution's demands. Other organised groups, such as the Revolutionary Socialists, have published statements with roadmaps that didn't deviate too far from the above-mentioned demands. The Salafist Watan Party spearheaded a national reconciliation initiative a few days before 30 June. Nine political parties, mostly Islamists, along with some twelve Islamist-leaning movements, have thrown their weight behind the initiative. These include the Muslim Brotherhood's Freedom and Justice Party and the Al-Gamaa Al-Islamiya's Building and Development Party. The statement by the army on Monday came only one day after mass protests on 30 June and gave political forces 48 hours to comply with the opposition's demands or it would propose a roadmap out of the crisis. It stressed that it did not aim to play a political role, but would rather support the will of the people. However, Article 153 of the recently-passed constitution dictates that if the president is no longer in office, the head of the parliament's lower house should take over. If the lower house is dissolved, however, then the head of the upper house (the Shura Council) is to take over and a new president will be elected within a maximum 90 days from the day the president's office becomes vacant. The transitional leader cannot run for office, however, nor request any amendment to the constitution or cabinet changes. Many road maps but the the source of the problem had not been addressed. The main sources of the problem are 1) Mubarak and cronies using their vast fast wealth funding the anti Morsi protests.It started from day 1 of Morsi's rule. Amr Moussa, Sabahi, and el Boaradei were all close to Mubarak. 2)The corrupt judiciary -The senior judges who were Mubarak appointees had been blocking the passage of electoral laws.3)The corrupt Police and the Minister of the Interior were irresponsible by planning/implementing security and therefore facilitate arson and other crimes by demonstrators. 4) The incompetent and unprofessional Military did not plan/implement contingency plan in the face of the Police and Minister of Interior's inaction.They should have demanded the civilian security authorities to take actions or face serious consequences. Instead, the military is making it worse by meddling in nations political dispute. Conclusion!!! Exclusion or isolating Morsi, will render all road maps doomed to failure because a government begotten through anarchy will only be meeting the same fate. No wonder the Islamist filled the parliament's lower house and the Shura Council. Familiar foreign agents in photo op. They are lined up to screw Egypt and make it an attack dog to protect Israel. Meanwhile all freedom loving Egyptians can starve and pay high interest to IMF for a handout to Egypt.